In our book, “The Guru Investor: How to Beat the Market Using History’s Best Investment Strategies”, we called Benjamin Graham the “Granddaddy of the Gurus” given his track record and influence on other value investors, including Warren Buffett, Mario Gabelli and many others. If Graham was the Granddaddy of the Gurus then I think the Price-to-Earnings ratio (or P/E for short), a ratio utilized by Graham, is probably the Granddaddy of the stock valuation ratios. But it’s important to understand the different ways PE can be calculated and how the various guru strategies utilize the ratio. Typically listed after a company’s name, ticker and market capitalization, the Price-to-Earnings ratio is probably the most widely used stock valuation tool, and is often used as a way to determine the perceived attractiveness, or value, a stock holds. 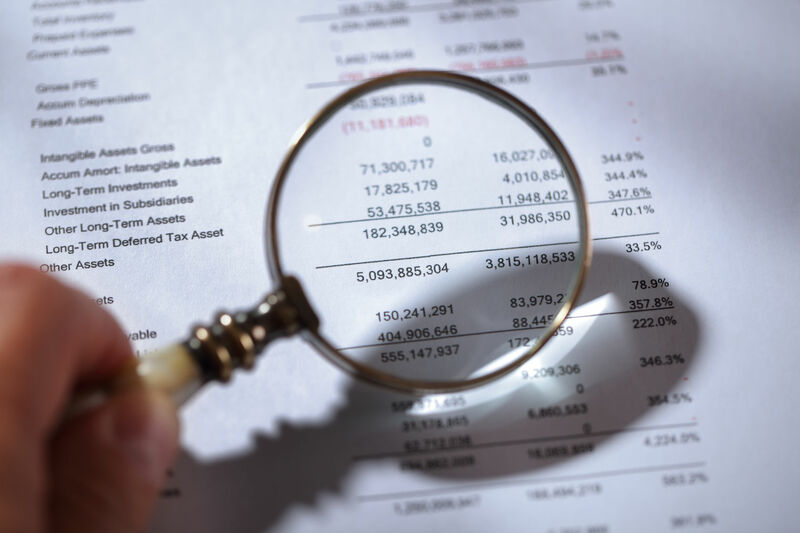 The P/E is referred to as a stock’s “multiple,” and the ratio is also used as a way to gauge the overall market’s valuation. A simple calculation, the P/E is derived by dividing the stock’s price (or the price of an index if you’re looking at the market) by the earnings of the company (or the holdings of an index). For instance, a company with a stock price of 20 and earnings of $1 per year would trade at a P/E of 20. If the same company saw its earnings increase to $1.50, the P/E would be 13.33. 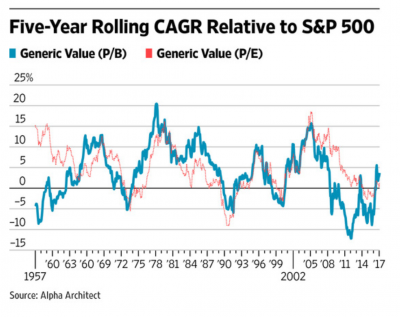 If the price rose to $25 but earnings stayed at $1, the P/E would be 25. So, as the math shows, the P/E can be influenced by the price of the stock moving up or down as well as by the level of earnings a firm is generating. Because prices change daily, the P/E is constantly in flux depending on investors’ willingness and appetite for stocks and risk as well as the timing within the market cycle. The chart below, taken from Validea’s internal market valuation tool, shows that at the end of 2008 and early 2009, the P/E (based on trailing earnings), dipped as low as 10 or 11. As of today, the market’s P/E is about 23, evidence of how much the multiple can change during parts of the market cycle. According to the website Multpl, the average P/E on the S&P 500 going back to the late 1800s has been 15.7, but over the last 40 years the multiple has been about 20, well above the historical average. In using the P/E, some investors use the trailing 12 months of earnings (TTM) and others use projected future earnings, which is typically based on Wall Street earnings estimates. Neither of these are perfect. Clearly, TTM represents past earnings, so using that to project forward may not be accurate, particularly for companies with highly volatile earnings. On the other hand, projecting earnings over the long term is very difficult, and even the smartest analysts have difficulty accurately estimating them. So, when using P/E in any analysis you have to decide if past or future profits are best suited for what you are doing. One thing to consider is that many smaller companies don’t have coverage on Wall Street. In those cases, there are no earnings estimates you can use and you are therefore stuck using TTM earnings. Here at Validea, most of our fundamental models use past earnings in the P/E ratio calculation and we use a longer term technique, inspired by Ben Graham, that looks at earnings over multiple years. This provides a mechanism for smoothing out variability and also gives us more than one data point to work with in making the calculation. Across Validea’s guru-based models, many of the approaches use the P/E in different ways (below is a summary table). In Validea’s Guru Analysis tool, you can see how any stock scores using these specific (among many other) criteria, based on the writings of these great investors. Ben Graham: This strategy based on Graham likes to see the lower of the current P/E (TTM) or the P/E based on the last three fiscal years be below 15. David Dreman: Dreman used a value composite to some extent, and he required two out of four valuation ratios, including the P/E, to be in the bottom 20% of the market. 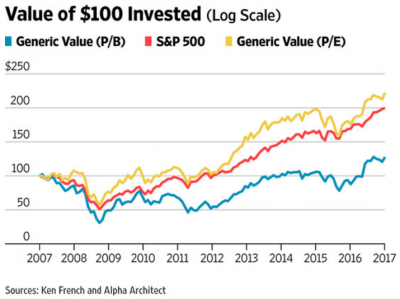 As of this writing only stocks with P/E ratios below 13.7 would pass this test. John Neff: Neff wanted to see P/Es that were 40% and 60% below the Market PE. Right now, the market carries a P/E of 21 so that range would be from 8.4 to 12.6. 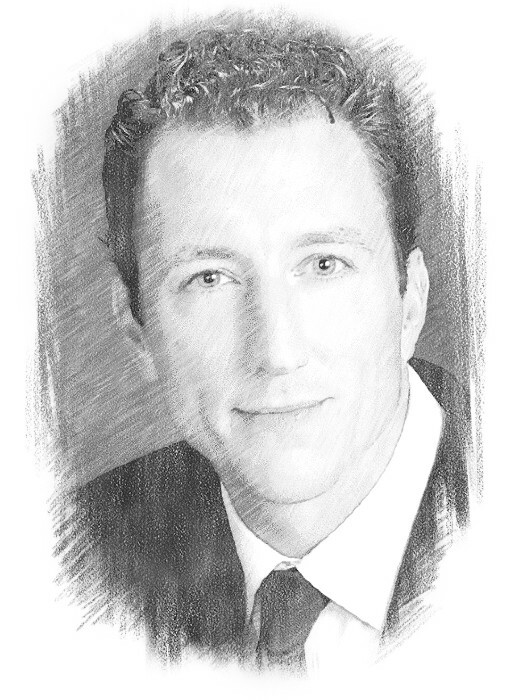 There was a good article recently in the Wall Street Journal by our friend Wes Gray, CEO and CIO at Alpha Architect. Wes shows the performance of a generic portfolio selected using the Price-to-Earnings ratio vs. another popular valuation metric, the Price-to-Book. 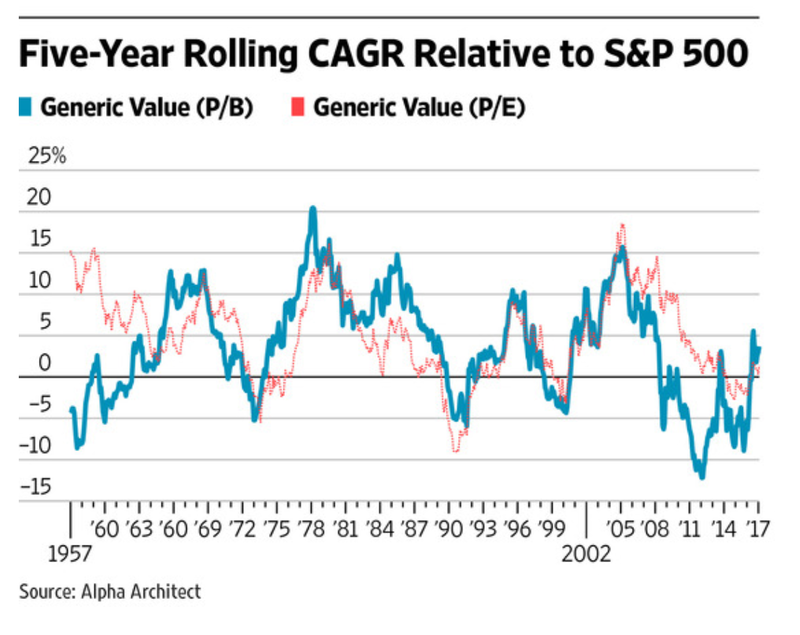 Value stocks have had a difficult stretch over the last few years, but the data shows pretty solid performance out of low P/E since 2007, and also on a longer term basis (see the second chart – when the lines are above 0 it indicates outperformance of value stocks over the broad market or the trailing five years). A few words of caution though. 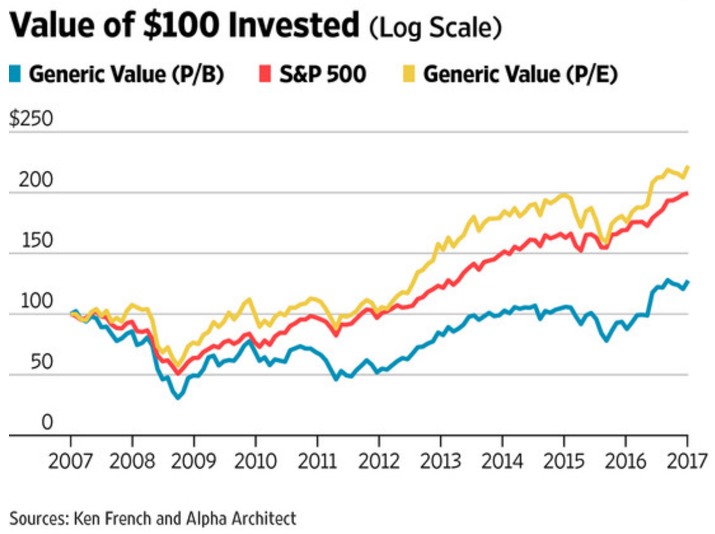 Sometimes the P/E doesn’t tell the whole story. Think of the energy sector in late 2015 and early 2016. As the price of oil and other commodities fell, the earnings of those energy companies also fell, or were expected to fall, but the downward pressure on profits wasn’t immediately reflected in the earnings. As a result, the prices of the stocks fell dramatically. This resulted in the P/E ratios of many energy companies to drop. This was appealing to investors, and many energy stocks rebounded significantly. But during the large sell-off in those names, the P/Es continued to look more and more favorable, which was misleading to some extent. This is known as a “value trap” – when stocks look cheap but their earnings are in decline and could be permanently impaired for some reason. No ratio or valuation measure will ever be perfect or fool-proof–which is why combining strategies and investment criteria using our Guru Analysis tool be helpful. The P/E ratio, however, offers investors a great start in identifying stocks that are trading at a discount (or premium) to the market or to a particular industry.